Cost-cutting is the new growth plan for MGM Resorts. Check out the latest MGM Resorts earnings call transcript. Now that MGM Resorts' (NYSE:MGM) construction growth cycle is nearly over, it's time to turn the gaming company into a cash flow machine. That's exactly what the company has in mind with its new MGM 2020 plan, announced as Las Vegas was recovering from New Year's Eve. Announcing plans to expand profitability and improve margins may sound like good news to investors, but it really shows where MGM's focus is going into 2019. And it isn't on the growth of the business, which isn't always good news for the long term. The core of MGM 2020 is an expected $300 million improvement in adjusted EBITDA, which is the measure we use to judge cash flow coming from a resort or casino. About $200 million of these "operating efficiencies" are expected to be realized by the end of 2020, with another $100 million in EBITDA expansion expected from digital revenue growth by the end of 2021. Half of the 2020 savings are expected to be from labor reductions, with another 25% from sourcing and 25% from revenue optimization. Now that resorts like MGM Cotai, MGM Springfield, Park MGM, and NoMad Las Vegas are up and running, management is saying it's time to optimize operations. That'll mean cutting staff rather than relying on growth to grow revenue and EBITDA. The other notable change in strategy is MGM's stated "digital transformation." There weren't a lot of details behind what that means, but this quote from MGM's press release gives the most information: "Over the next few years, the Company expects to reallocate a portion of its annual capital expenditure budget to specific technology advancements that will increase revenues and grow market share by innovating and elevating the guest experience through data, pricing, digital and loyalty capabilities and optimizing business mix." Reading between the lines, it looks as if MGM is going to try to maximize revenue per customer using its loyalty program and data collection sources. This may mean reducing comps for some customers and raising room rates or event ticket pricing in some cases. We also likely will see data collection from sports betting across the country become more important. MGM has made partnerships with the NBA, NHL, and MLB to expand data collection on customers and offer unique betting options with direct data from sports leagues. Most of this betting will be done digitally, so MGM can optimize odds and other pricing as part of its "digital transformation." Think of it like replacing a real-life bookie with a digital bookie, which raises margins for MGM. MGM Resorts' management is seeing two things when it comes out with a plan like MGM 2020. One is that revenue growth is slowing, so it needs to find bottom-line growth somehow, and the only option is cost-cutting. The second thing is that margins have suffered the last two years as the company has spent money to expand in the U.S. and Macau. 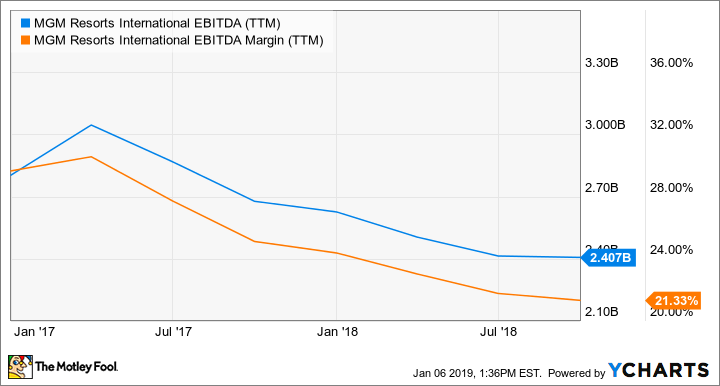 Management wants to reverse the margin trend you see above and return to an EBITDA margin that's closer to the 30% that it sees when it's running most efficiently. That margin expansion will help the bottom line over the next three years, but watch for top-line growth as well. If margins expand at the expense of the top line, it may not be worthwhile in the long term.